I was excited about making these pops, more about the aesthetics than the taste but when I tasted them it was like an ice-cream with a hard chocolate shell yet the “ice-cream” & “chocolate” is completely vegan. I like to take things at a leisurely pace in the kitchen but for this recipe you need to work fast bc of the raw vegan chocolate going solid. Fill a bowl 3/4 full w boiling water. Place the bowl you are making the chocolate in, over the bowl of boiling water to ensure it stays warm. 3. 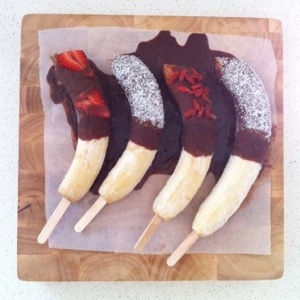 Once you are ready, simply dip the banana in the melted chocolate sauce. The biggest issue I encountered was by dipping the banana to the bottom of the bowl, the top of the banana kind of melted (rookie error, I know). 4. Repeat – one layer is not enough & doesn’t look thick enough. 5. If you’re going to decorate – now is your chance to roll quickly in coconut / goji berries / chopped almonds. These taste so good – be sure to give to your friends who don’t think vegans can enjoy good treats! I kept these in the freezer in a sealed plastic container for about a week. This entry was posted in Recipe and tagged banana, choctop, coconut, dairyfree, glutenfree, gojiberries, icecream, nicecream, rawveganchocolate, sugarfree, vegan, veganicecream by 6 Clean Ingredients. Bookmark the permalink.